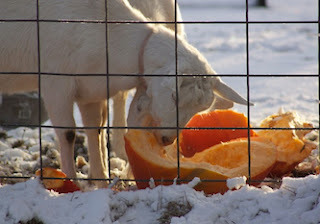 Rachel's goats chowing down on left over pumpkins. There are many great reasons for raising goats, one of my favorite reasons is because I can recycle so much food that would otherwise be dumped. We keep a large plastic container in our kitchen where all of our scraps (no egg shells) are saved for daily delivery to the goats. Left over melons, squash and pumpkins make a great supplement to any goat's daily diet. Like with any other feed item, they will stop eating when full. Kansas goat owner, Rachel Ducote, says, "after Thanksgiving many pumpkins are forgotten on front porches. I asked our neighbors for them and received lots of free pumpkins and squash. They make a great treat! Milk production went up!" My goats love Christmas trees as well. When I lived in the city with my 2 Nigerian Dwarf goats, our neighbors stopped putting tinsel on their trees so they could give them to my ladies after the holidays passed. As long as the tree hasn't been treated with any chemicals and there are no ornaments, strings etc. still attached the trees make an excellent snack!